backcountry travel | Heart's Pass. Home to sub-alpine larch and bears. Heart's Pass. Home to sub-alpine larch and bears. Heart's Pass is beautiful highcountry pass near Mazama, Washington. The first picture shows a gorgeous, lush green sub-alpine larch stand and a view of Osceola peak on the horizon. The picture was taken from Shellrock pass, a little lesser known, but only a day hike from Heart's pass. One thing that impressed me about the sub-alpine larch was it's ability to thrive high up on rocky slopes that took me hours of climbing - short of breath and on aching feet - to reach. They're the hardiest of trees in the Pacific Northwest and are only seen dominating the slopes and cirque basins no other tree could survive on. Although these rugged trees look like the evergreens so typical of the Northwest - they're not! They're deciduous! The second picture shows some sub-alpine larch leaves turning golden. (And that's me!) They are so pretty in late September! If you've never seen a larch change color like the broadleafs of the Northeast, I highly recommend taking a trip to Heart's pass. 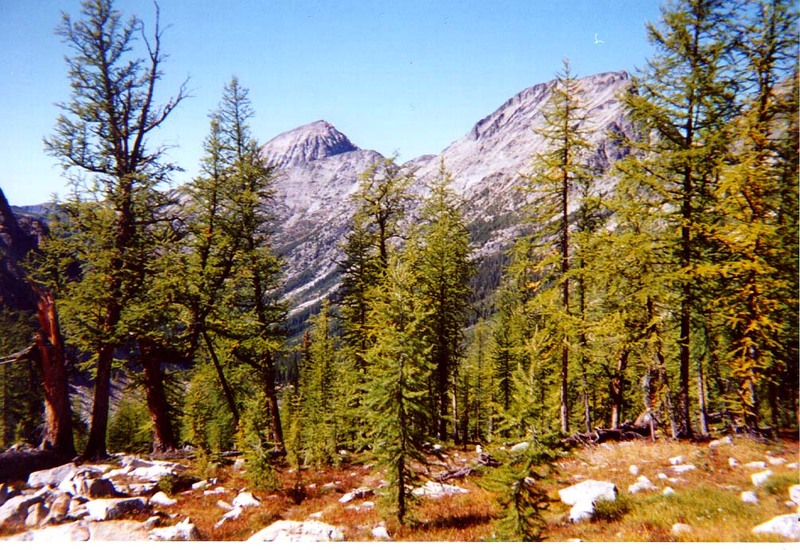 I came across these trees for the first time during a volunteer expedition in which I was helping to estimate the grizzly bear population of the North Cascades. We saw a lot of neat evidence of bears rooting for ants in downed logs and overturned boulders. The wildlife was rich around Heart's pass. We saw a lot of Grouse and even a Sawet owl!